Initially conceived as a methodology for the representation and manipulation of imprecise and vague information, fuzzy computation has found wide use in problems that fall well beyond its originally intended scope of application. Many scientists and engineers now use the paradigms of fuzzy computation to tackle problems that are either intractable or unrealistically time consuming. The extraordinary growth of fuzzy computation in recent years has led to the development of numerous systems of major practical importance in fields ranging from medical diagnosis and automated learning to image understanding and systems control. 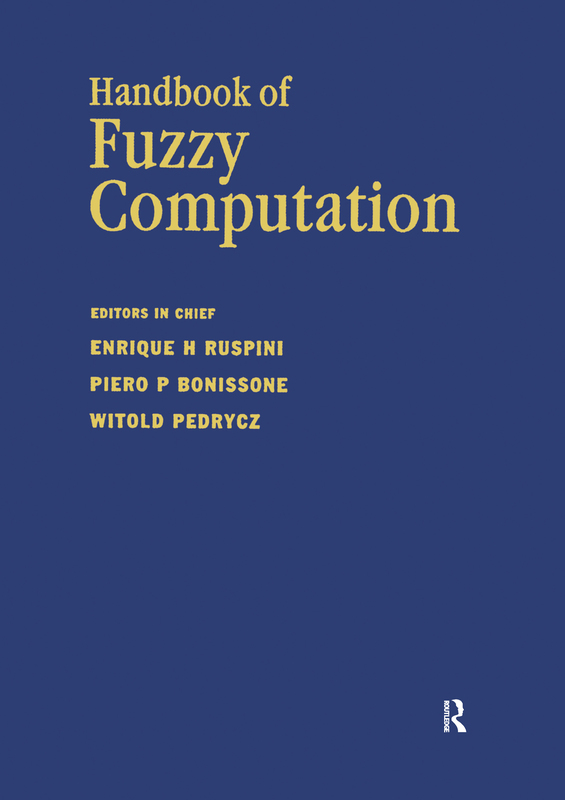 The Handbook of Fuzzy Computation provides information about fundamental aspects of the field and explores the myriad applications of fuzzy logic techniques and methods. Divided into several parts, the handbook presents basic conceptual considerations and case studies of applications of fuzzy computation. It covers the fundamental concepts and techniques for system modeling, information processing, intelligent system design, decision analysis, statistical analysis, pattern recognition, automated learning, and system control and identification. The book also discusses the combination of fuzzy computation techniques with other computational intelligence approaches such as neural and evolutionary computation. By focusing on the application of fuzzy computation methods to solve problems, this all-encompassing reference work enables scientists and engineers to understand the central aspects of this important computational methodology. "This handbook is the most comprehensive source for the theories, technologies, and applications of fuzzy logic. It can also serve the needs of a wide range of readers, from researchers and students in academia to practitioners in industry." Vagueness and uncertainty: Theories of vagueness. Theories of uncertainty. Fuzzy sets: concepts and characterizations: Introduction. Operations on fuzzy sets. Interpretations of fuzzy sets. Fuzzy relations. Characterization of fuzzy sets. Fuzzy measure and integral. Fuzzy mathematical objects. Extension principle. Fuzzy set calculus: Introduction. Membership function elicitation. Fuzzy relational calculus. Fuzzy arithmetic. Possibility theory. Fuzzy reasoning: Introduction. Fuzzy inference. Defuzzification. Fuzzy models. Modeling and simulation: Granule-based models. Logical aspects of fuzzy models. Statistical models. Fuzzy Petri Net model. Model acquisition. Approximation aspects of fuzzy models. Introduction: motivation for hybrid approaches. Neuro-fuzzy systems. Fuzzy-evolutionary systems. Software approaches: Programming languages. Knowledge-based systems. Database management, information retrieval, and decision support systems. Hardware approaches: Desirable features. Adapting existing hardware to fuzzy computation. Analog approaches. Digital approaches. Hybrid (digital-analog) approaches. Knowledge based systems: Knowledge representation. Inference methods. Control methods. Design methods. Control. Principles of fuzzy controllers. Fuzzy control approaches: General design schemes. Cell maps. Sliding mode control. Predictive control. Hierarchical control. Model-based control. Optimal fuzzy control. Machine learning: Introduction: learning fuzzy concepts. Supervised learning. Reinforcement learning. Data and information management: Fuzzy databases. Information retrieval. Case-based reasoning. Decision making and optimization: Decision-making models. Optimization. Pattern analysis. Computer vision. Aerospace: Proximity operations spacecraft controller: a case study in fuzzy logic control. Systems control: DC/DC converters fuzzy control. Fuzzy control in telecommunications. Fuzzy-neural traffic control and forecasting. Systems control. Backlash compensation using fuzzy logic. Neurofuzzy modeling for nonlinear system identification. Nuclear engineering: Application of fuzzy logic control system for nuclear reactor control. Manufacturing: Applications of fuzzy set methodologies in manufacturing. Compensation of friction in mechanical positioning systems. Diagnostics: Possibilistic handling of uncertainty in fault diagnosis. Robotics: Autonomous mobile robot control. Chemical engineering: Chemical engineering application. Water treatment: Water treatment application. Automotive: Improvement of the relationship between driver and vehicle using fuzzy logic. Traffic engineering: Traffic engineering application. Civil engineering: Civil engineering application. Engineering design: A fuzzy sets application to preliminary passenger vehicle structure design. Oil refining: Neuro-fuzzy hybrid control system in petroleum plant. Medicine: CADIAG2: hospital-based computer-assisted differential diagnosis in internal medicine. Neural networks for ECG diagnostic classification. Information science: Case-based reasoning. Information retrieval: a case study of the CASHE: PVS systems. Economics, finance and business. Decision support system for foreign exchange trade (FOREX). Operations research: Scheduling. Fuzzy sets in operation research: forecasting, a case study. Quality design using possibilistic regression and optimization. Inventory control. Time series prediction.